On the western edge of Cook Inlet, Lake Clark National Park is an intriguing balance of easy access and remote wilderness. Lake Clark bear viewing is legendary. Returning salmon in Crescent Lake, Chinitna Bay and Silver Salmon Creek draw brown bears fattening up on the runs. Floatplanes take off from Anchorage’s Lake Hood for day tours to the best viewing spots. Just 100 miles away by air, the flight into the park is brief but amazing. Redoubt Bay Lodge and Bear Mountain Lodge sit just outside the boundary, and are windows into the wonders of the park. There’s no way into the park by road, so it’s on the dream list for wilderness hiking, lake kayaking and rafting. 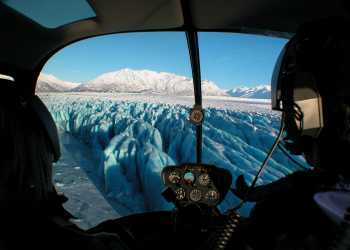 No need to go it alone; guides like Alaska Alpine Adventures can help explore the park’s wonders.